Retrovolve – How Many People Has the Berzerk Arcade Game Killed? 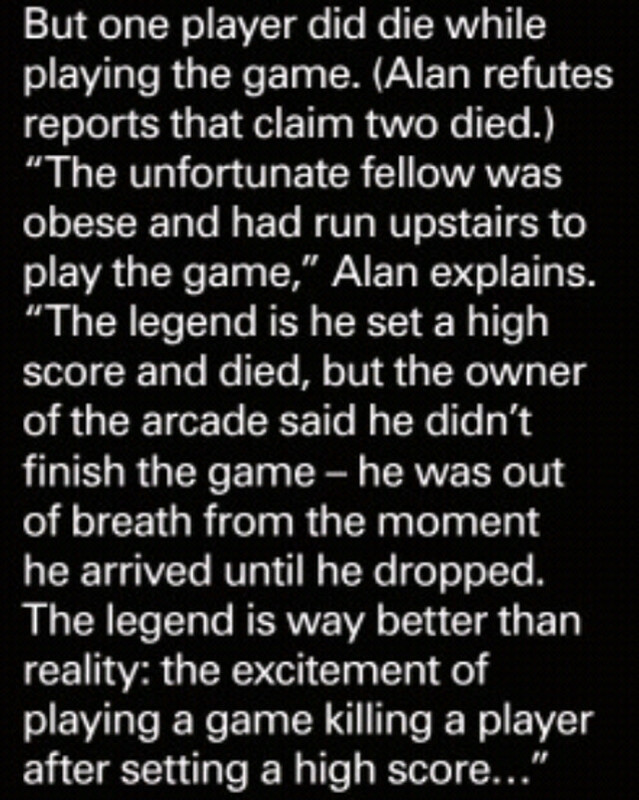 Perhaps the most macabre piece of trivia about this arcade game, however, is that it’s infamously known as the first arcade game to be tied to the death of its players. Now, urban legends are bound to spring up from circumstances like this, and it’s been said that Berzerk had killed three people at Friar Tuck’s Game Room arcade in Calumet City, Illinois. The scary thing is, at least two of these deaths actually happened. The first — and the one that is almost certainly more urban legend than truth — was Jeff Dailey, who allegedly had entered his initials twice in the Berzerk machine’s top ten players list before dying of a heart attack. Weird detail: His score was 16,660 (remove the “binary” numbers, 1 and 0, and you’ve got 666). Reports are conflicted about this, though it’s been claimed that Dailey had been friends with Peter Burkowski, death number two. Berzerk‘s designer Alan McNeil has publicly refuted one death while acknowledging the other, according to a sidebar titled “Kill the Humanoid!” in Issue 47 of Retro Gamer magazine. 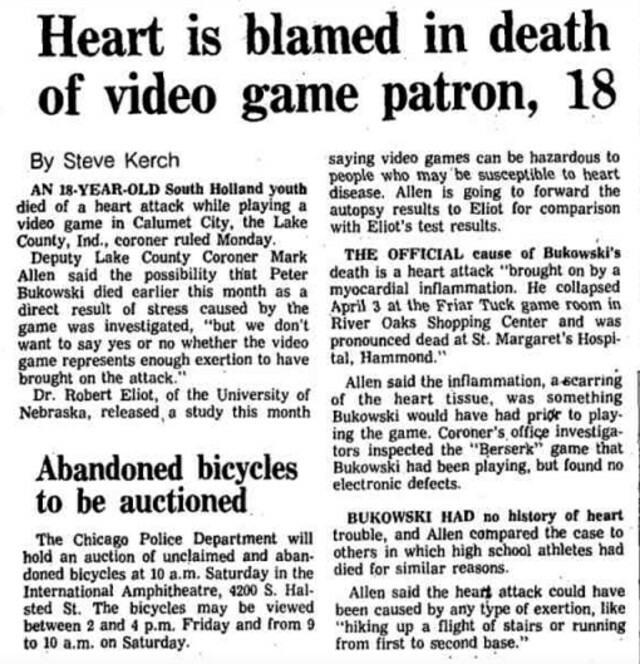 The third death may have had absolutely nothing to do with Berzerk, though it took place outside the very same Friar Tuck’s Game Room in 1988. Sources claim there was an altercation that ended when one arcade-goer decided to stab another to death. Some have suggested the fight started over a quarter that was inserted into a Berzerk machine (the very same one Burkowski had played? ), though this is a difficult detail to confirm now that so many decades have passed. 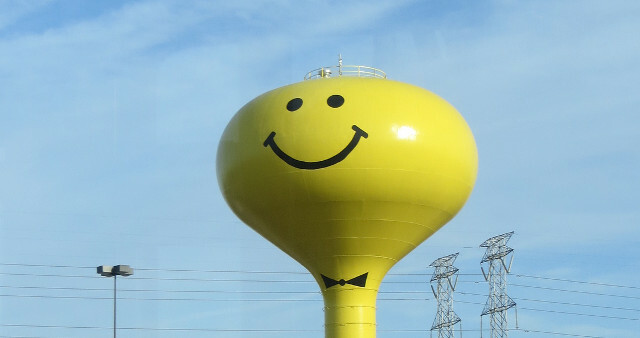 Of course, one of the most eerie details about this whole thing is that Calumet City is home to not one but two water towers that bear a striking resemblance to Evil Otto. 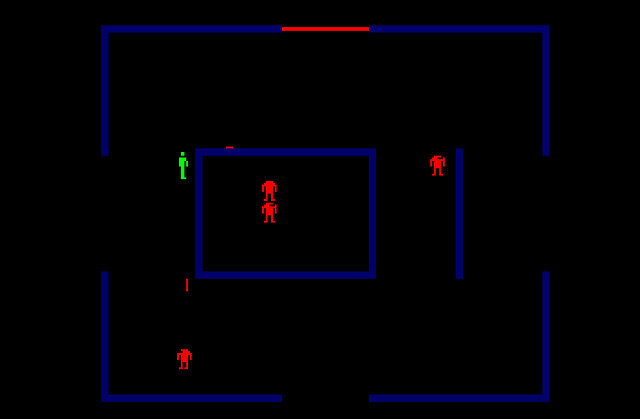 I wonder if this is why there hasn’t been a home version of Berzerk in ~30 years. I still wish they would make one. It’s so simple yet still so fun. I had Berzerk on the Atari 2600 when I was a wee little kid (maybe 5?) and I freaking loved it. That and Robot Tank are the 2600 games I played the most by far.